Woodland Trails Bed and Breakfast is a country inn in Hinckley, Minnesota, built in 2003 to be a B&B and upgraded regularly since. The building has modern features like soundproofing, geothermal heat and central air conditioning. Innkeeper Sandra’s tasteful decorating adds to the rustic ambiance. Located in the country on the Wisconsin border between Hinckley, Minnesota and Danbury, Wisconsin, the inn is perfect for a Minnesota getaway to simply relax and reconnect with each other or to celebrate a special occasion like an anniversary, birthday or coming addition to the family. 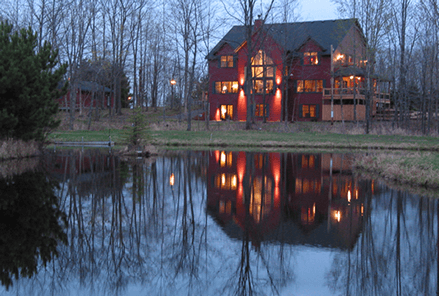 Woodland Trails Bed and Breakfast is less than two hours from the Twin Cities, St. Cloud, Eau Claire or Duluth. 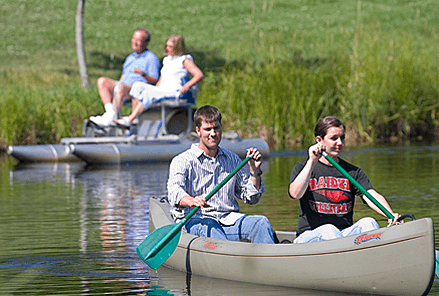 The setting is wooded and overlooks Grace Lake Too, a private pond that is perfect to stroll around or to traverse with a canoe or paddle boat. A gazebo with deck and fire pit is great for an evening campfire, even in winter! Guests enjoy the miles of private trails for hiking, snowshoeing (we have snowshoes) and, from May through October, riding in comfort on complimentary golf carts or on our new fat tire bikes. 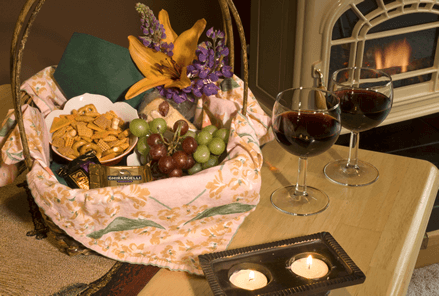 Women love the clean, cozy, welcoming atmosphere and innkeeper Sandra’s decorating. Men love the rustic atmosphere, including a replica of Jim Jordan’s world-record buck hanging over the fireplace, and the many things to do both inside and outside. Guest rooms are spacious with a fireplace for ambiance, comfortable sitting area, whirlpool tub, table and chairs, Direct TV and private deck or patio. From inside the B&B, guests enjoy the inviting common areas for reading and conversation near the wood-burning fireplace in the Great Room and watching birds, deer and other wildlife out the windows. A three-course breakfast is served in the dining room at 9:00 and can best be described as a fun, social event. Conversations around the table often go on for an hour or more after dessert. (Yes, course #3 is dessert for breakfast!) An option, for those who want more privacy, is a deluxe continental breakfast brought to the room. Also see our dining guide for restaurant choices in the area. Special for our Past Guests! Be sure to see our Newsletter! See the results of this year’s Free Night Contest run just for Past Guests as a way of saying, “Thank You!” for coming back. Take a Summer Tour of the B&B.